So as you know, I love me some niche research, in fact; I would even consider it as a “hobby” for me. Yes, I love affiliate marketing, and I love researching and picking niches (I do it for my niche portfolio and I was also responsible for pick niches for an affiliate company I was working prior to going “full-time”). you need to know the what, the why and the how and for some, I fully understand that it can be a daunting task to pick a niche (that has the chance to be profitable online). 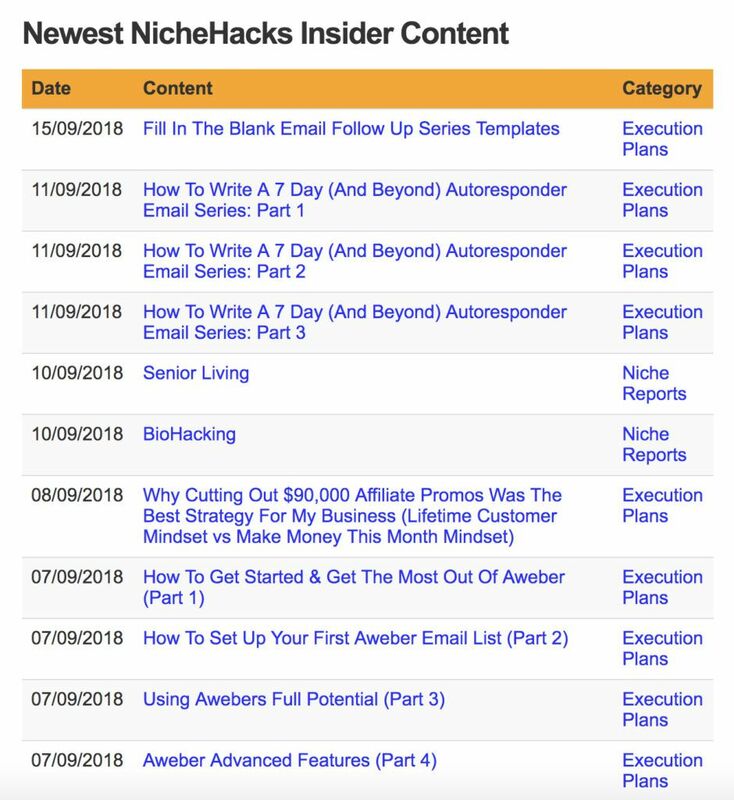 Today I am doing my Niche Hacks membership site review and as you will see; if you’re having issues picking your niche, you’re going to want to check this out. 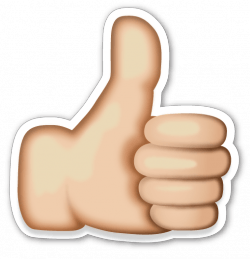 NicheHacks.com is a blog run by Stuart Walker, a successful affiliate marketer, and (from what I have seen and read) an all-around awesome fellow. You can find about more about Stewart (and his team) on his blog and also in this interview. Now while the “main” website – NicheHacks.com – is about picking a niche and promoting your website to the masses, it also has a “members-only” type platform that comes with a cost (more on pricing below), which is what I will be reviewing today. 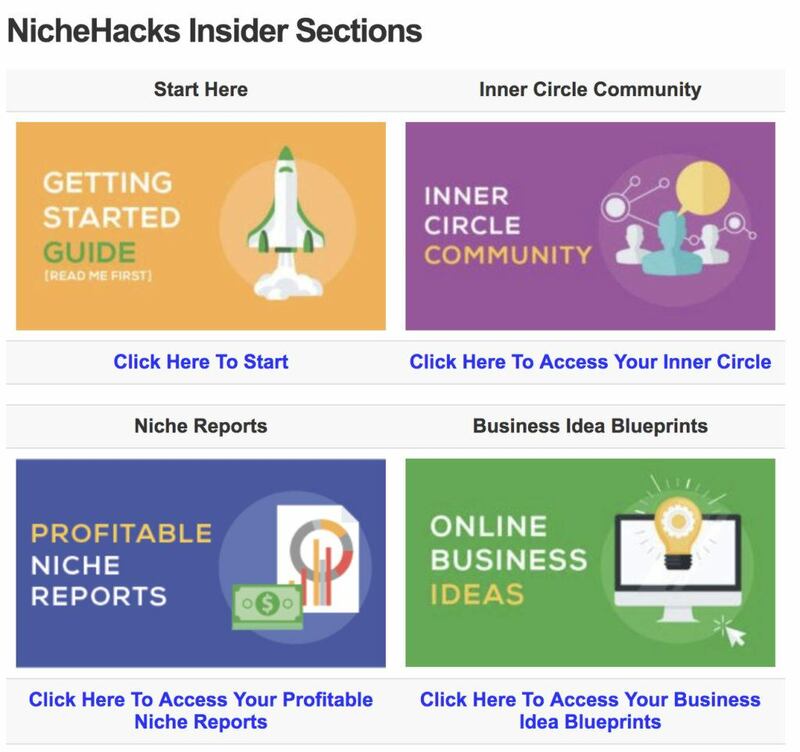 What Is Niche Hacks Membership? 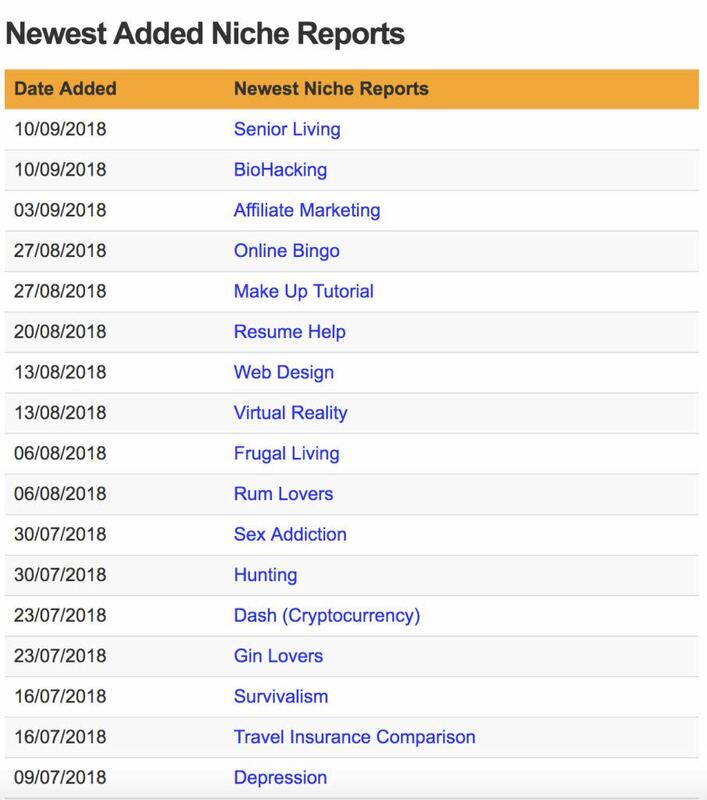 Now while there are plenty of websites and training courses that will show you how to pick a niche, Niche Hacks is different in the fact that it provides “niche reports” which are highly detailed insights to different niches. At the time of writing this, there are over 200+ niche reports in various sectors that you can get access to, download and have on your computer. Now while this is not all you get with a Niche Hacks membership, it definitely is the selling point of this program and the reason it is such a huge success. In the past 7 years or so I have been doing affiliate marketing I have never come across such a great resource that goes that deep in niche picking and market research. What D0 You Get With Each Report? 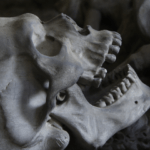 What Do You Get With A Niche Hacks Membership? Of course, picking a niche is only half the battle. 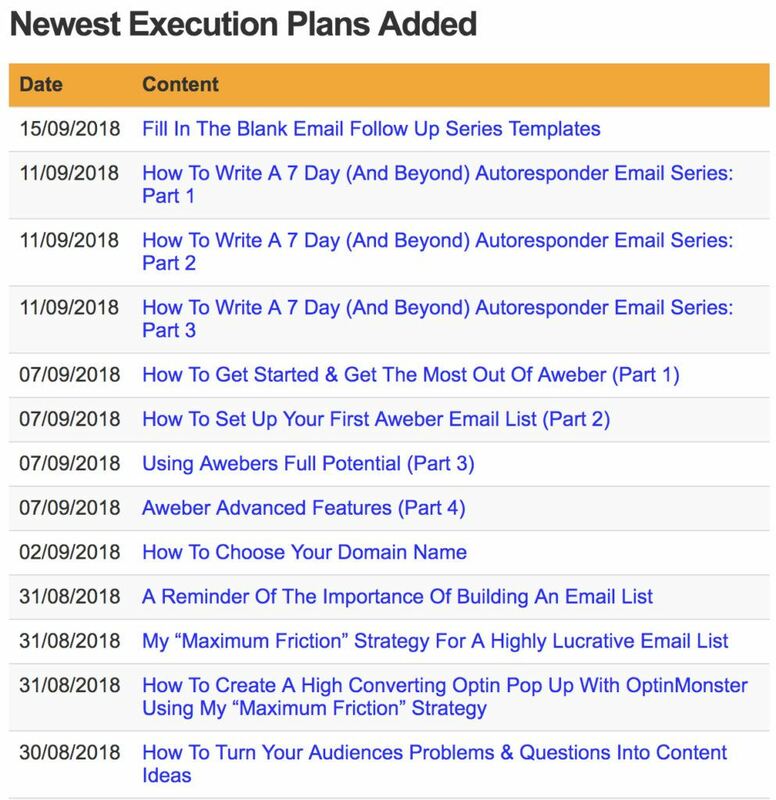 A detailed, structured and proven roadmap of how to go from “idea” to “live website” receiving traffic and hopefully even sales. This is an invitation to join the Niche Hacks Facebook Group, which at the time of writing has 546 members. This is where you will find a list of all the 200+ niche reports mentioned above. The list goes deep, and this section is chock full of information. If you fail to find a niche for you to focus on in this list, then I am afraid you’re being way too picky and rigid – get it moving man. There are many ways you can “spin” a niche topic. For example, you can build a review website or a price comparison website. It depends on the niche and also your strengths and what your goals are with this niche. To be honest, these are mostly links pointing to articles that are available on the main Nichehacks.com website for free. 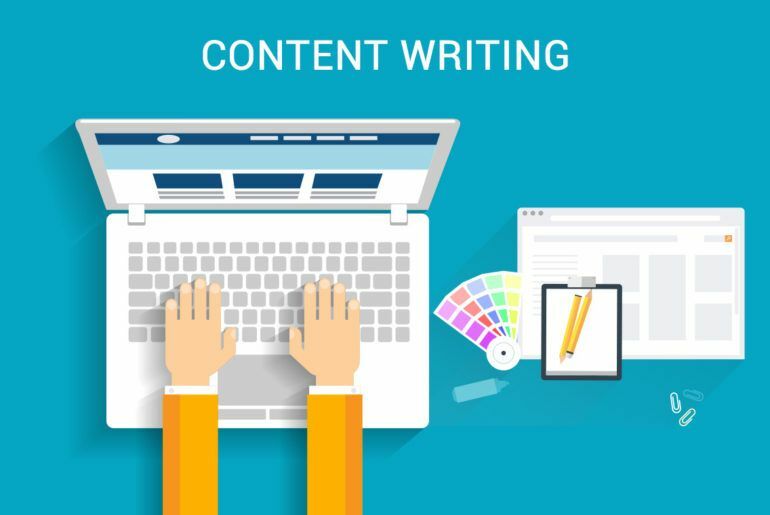 If you want to learn more about niche websites and how to build them, then you would do well in reading the blog first. In this section, you will find a collection of well thought out ideas, tips and how-tos complied by various online entrepreneurs with the hopes of educating you on the journey ahead. I find way too many hopefully affiliate markets underestimate the effort need to make money with affiliate marketing, and this section will help show you the way from experienced marketers and entrepreneurs. How To Outsource &Automate Your Business. Great material – detailed too. I really enjoyed this section and the best thing about this is that you can always download these documents and files for later reading. These are all filled with printable documents you can print out and follow along with as you are building your site. May not be everyone’s cup of tea but incredibly useful if you want to make sure you are following the rights steps and procedures for success (which I do recommend). 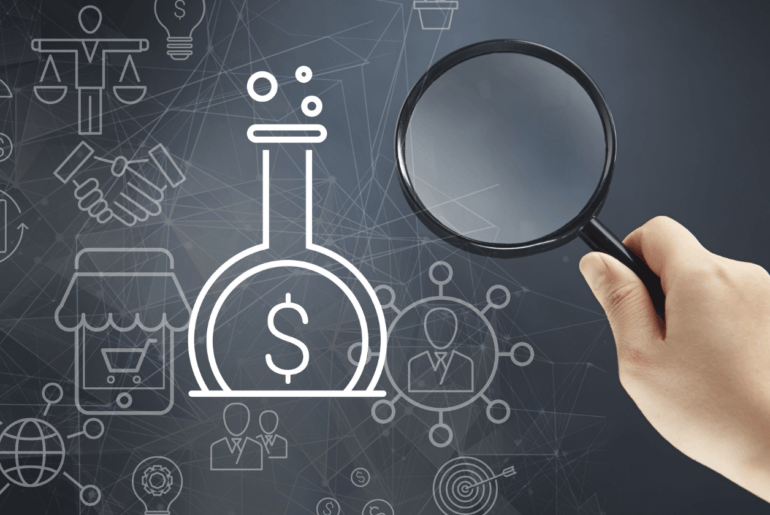 Another round of linked helpful articles that will help you better understand the entire flow of building niche sites from “idea” to “making money”. What theme should I use for my website? All the common beginner-type Qs you may have about starting an online business can be found here. There’s a great support system inside Hiche hacks, and as a premium member you can get in touch via email but for general requests, it’ best to leave a comment on the Facebook Group mentioned above. The support system is mostly for login access, an issue with membership, technical difficulties, etc. I obviously had to blur out the actual email as not to expose the admin team email to non-members. Now, as you may agree, the Niche Hacks membership site is one hell of a resource for affiliate marketers, and I am sure you do not expect it to be free. However, you’d be surprised to know that compared to how much value you’re getting, it is a bargain. 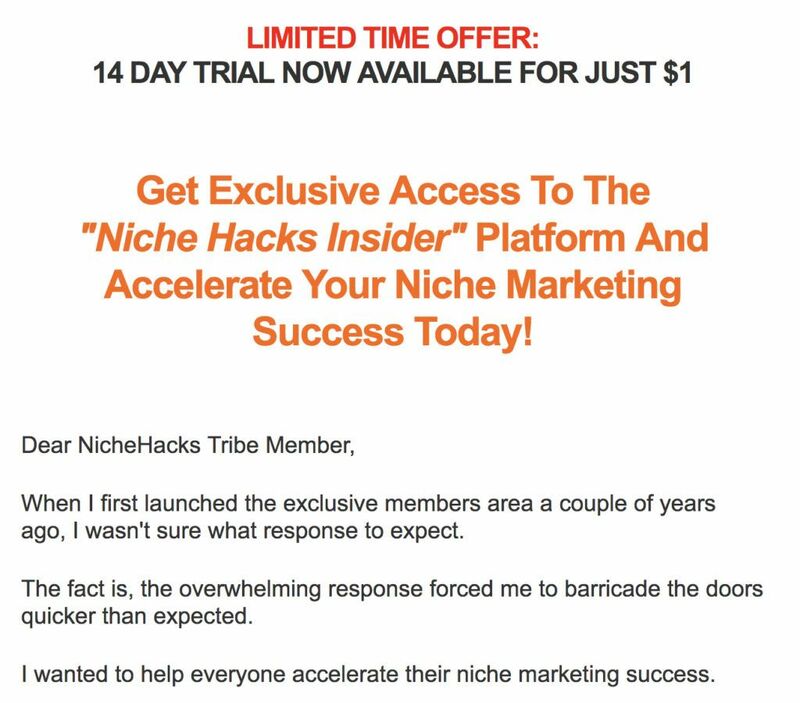 At the current time – and I do believe the price will be going up soon as more niche reports get added – a Niche hacks membership site subscription will cost you $59.99. I guess it’s good to note here that I am NOT an affiliate for Niche Hacks so my review and my “bias” is not meant to convince you to spend money so I can earn money. At the time of writing this, there’s a special offer running which would give you 14-day unlimited and unrestricted access to the membership site for only $1. Not that you’d want to, but if you ever plan on cancelling your subscription to Niche Hacks, then you do not have to jump through every loophole to do it. On the main homepage, you will find the simple “one-click unsubscribe’ button, and you’re good to go. Super easy and super transparent. 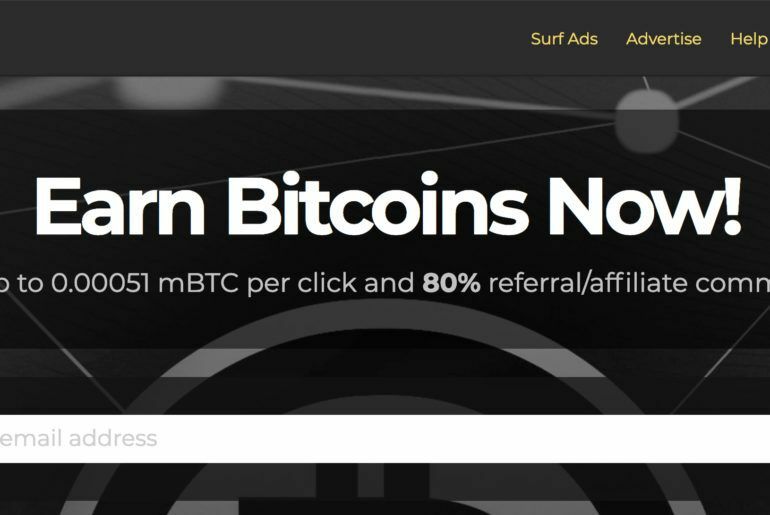 Wealthy Affiliate vs. Niche Hacks Membership Site? Now, as some of you may know, my main “affiliate marketing training course” I promote is the great Wealthy Affiliate. How does Wealthy Affiliate compare to Niche Hacks? Well, they are two very different things. While they both, provide you training on how to build an affiliate marketing business, I would say the Wealthy Affiliate membership is much better than the one that can be found in the Niche Hacks membership site. With that said, I can also tell you that Niuche Hacks completely trumps WA with its in-depth niche reports and as I said; no other site can compete with them for that topic. If you can, I suggest you get both (especially if you can get Niche Hacks on the $1 trial), but if not; my top suggestion would still be Wealthy Affiliate. So if you’re new to affiliate marketing and you are ready to learn from a great resource, both are good options for you and both can get you to your end goal if you work hard. While I would say, Wealthy Affiliate is the better choice here (you can start with Wealthy Affiliate for free here) I am sure Niche Hacks boasts a lot of successful money making students as well. Do I Recommend Niche Hacks? I love their products and their services, and they indeed have a unique product on the market. Well done Stuart Walker and the whole team. Thank you for reading my Niche Hacks membership site review, I hope you’ve found this helpful and informative. If you have any questions, be sure to let me know as I’d be more than happy to assist you in any way I can.